The SuperWand’s exclusive 360º detection fi eld provides uniform sensitivity and tip pinpointing to detect weapons and other metal objects with extreme accuracy. 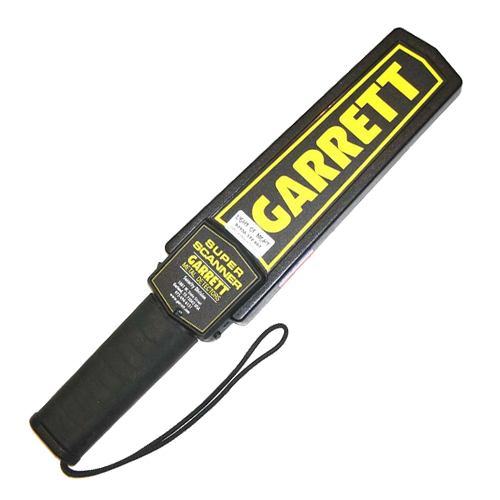 From U.S. airports to sporting events, the SuperWand is the hand-held of choice for today’s security screener. • Optimum sensitivity:detects ferrous, non-ferrous and stainless steel weapons, contraband and other metal objects. • Self-calibrating:digital microprocessor technology eliminates the need for periodic sensitivity adjustments. • Elongated profileprovides 8.75" scan area 360° detection coverage plus tip pinpointing for easy scanning from head to foot. • Easy and convenient to usewith one-touch button and three-color LED lights. Green LED light indicates ON; Amber LED indicates LOW BATTERY: Red LED indicates ALARM. • Clear audible or Silent / Vibrate LED alarm signal. • Rugged injection molded constructionincluding structurally isolated coil for added impact absorption. Exceeds Mil-Std-810F (drop test) Method 516.5, procedures II and IV. • Ergonomically designed gripfits comfortably in virtually any size hand. • Easy ON/OFF battery cover:standard 9V battery included. Optional rechargeable battery kit available. • Power switch and LEDspositioned for easy access and high visibility.